If Anheuser-Busch InBev NV and SABMiller combine, it would create a massive beer conglomerate featuring some of the most recognizable brands in the world, including Budweiser and Miller. One of the largest brewers in the world Anheuser-Busch InBev NV is preparing a bid to buy its rival SABMiller, according to news reports. If true, the union would create a massive beer conglomerate featuring some of the most recognizable brands in the world, including Budweiser, Coors Light, Corona and Miller. 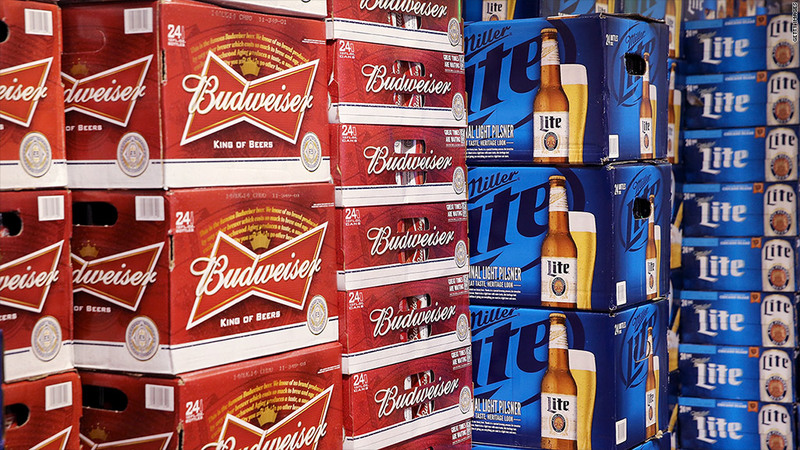 AB InBev (AHBIF) is talking to banks about financing a $122 billion bid for its rival SABMiller (SBMRF), according to the Wall Street Journal and other news reports. The companies would not verify these reports for CNNMoney. SABMiller spokesman Richard Farnsworth and AB InBev spokeswoman Karen Couck said separately that they do not comment on market speculation and rumor. The merger reports come just days after SABMiller tried to buy Heineken (HEINY), but it was rebuffed by the Dutch brewer. AB InBev's brands include Budweiser, Stella Artois, Beck's and Corona, while SABMiller's coffer has Coors Light, Miller High Life, Miller Genuine Draft, Foster's, Milwaukee's Best, among others. While all these brands can be found in stores all across America and other parts of the world, the world's most popular brand is unknown to most Americans. Snow, the world's leading beer brand, can only be found in China.